With the Treasure Garden steel umbrella base with casters you can bring the shade to you no matter where you choose to lounge. 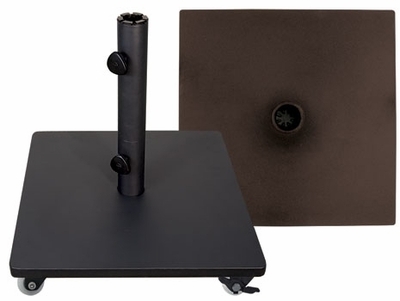 This heavy duty umbrella base holds, protects and stabilizes your favorite patio umbrella. Versatility abounds with this outdoor stand that is easily moveable with its convenient casters. Its heavy duty 120 lb. base is strong enough for commercial use and is also great for your personal patio tabletop or free standing use. It features various powder-coated finishes to choose from that will look fantastic with any decor. A functional and stylish addition to your patio space that will complete your upscale outdoor look.